The main idea used to interpret the ancient history of India, which we still find in history books today, is the theory of the Aryan invasion. According to this account, which I will briefly summarize, India was invaded and conquered by nomadic light-skinned Indo-European tribes from central Asia around 1500-1000 BC. They overran an earlier and more advanced dark skinned Dravidian civilization from which they took most of what later became Indian civilization, the proper credit but eradicated all evidence of their conquest. All that the Aryans really added of their own was their language ( Sanskrit, of and Indo-European type) and their priestly cult of caste that was to become the bane of later Indic society. The so called Aryans, the original people behind the Vedas, the oldest scriptures of Hinduism, were reinterpreted by this modern theory not as sages and seers the rishis and yogis of Hindu historical tradition but as primitive plunderers. Naturally this cast a shadow on the Hindu religion and culture as a whole. The Aryan invasion theory is not a mere academic matter, of concern only to historians. In the colonial era the British used it to divide India along north-south, Aryan Dravidian lines an interpretation various south Indian politicians have taken up as the cornerstone for their political projection of Dravidian identity. The Aryan invasion theory is the basis of the Marxist critique of Indian history where caste struggle takes the place of class struggle with the so called pre Aryan indigenous peoples turned into the oppressed masses and the invading Aryans turned into the oppressors, the corrupt ruling elite. Christian and Islamic missionaries have used the theory to denigrate the Hindu religion as a product of barbaric invaders, and promote their efforts to convert Hindus. 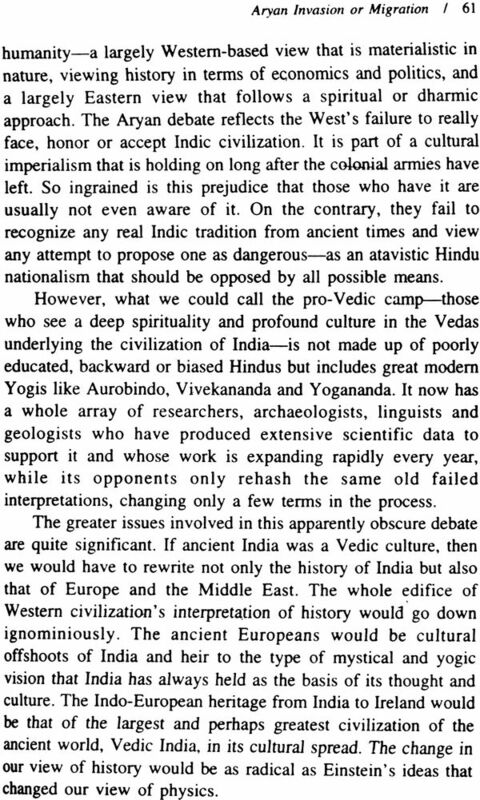 Every sort of foreign ideology has employed it to try to deny India any real indigenous civilization so that the idea of the rule of foreign governments or ideas becomes acceptable. Even today it is not uncommon to see this theory appearing in Indian newspapers to uphold modern, generally Marxist or anti-Hindu political views. From it comes the idea that there is really no cohesive Indian identity or Hindu religion but merely a collection of the various peoples and cultures who have come to the subcontinent, generally from the outside. Therefore a reexamination of this issue is perhaps the most vital intellectual concern for India today. 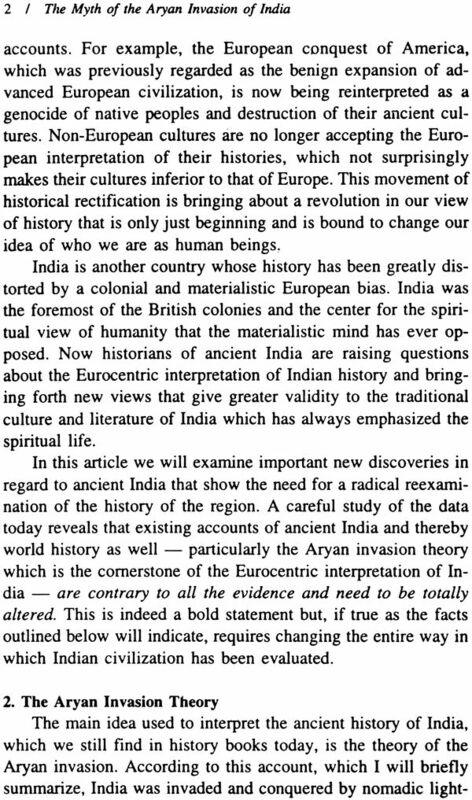 The propositions of time, place and people for the Aryan invasion has continually shifted as it has always been a theory in search of facts, not one based on anything solid. The only logical conclusion of the continual retreat of the Aryan invasion theory from a destructive invasion to a pastoral migration is the complete abandonment of it. The continual changes in the theory relative to the data which disproves it only shows the invalidity at its core. The Aryan invasion has gone from a bang to whimper and will soon fade out altogether. David Frawley is one of the few Westerners ever recognized in India as a Vedacharya or teacher of the ancient Vedic wisdom. His field of study includes Ayurvedic medicine, Vedic astrology, Yoga and Vedantic philosophy. His more specific work is with the Vedas themselves, including a reexamination of ancient history in light of new archeological finds in India and a more critical examination of Vedic texts such as occurs in the present volume. He has written ten books and many articles on these subjects over the last fifteen years, which have been published both in India and the United States. In India his translations and interpretations of the Vedas have received acclaim from both spiritual and scholarly circles. Presently, he is director of the American Institute of Vedic Studies in Santa Fe, New Mexico, USA. His most relevant books to the present volume are Gods, Sages and Kings: Vedic Secrets of Ancient Civilization, 1992; Wisdom of the Ancient seers: Selected Mantras from the Rig Veda, 1993; and Vedic Aryans and the Origin of Civilization(co-authored with Navaratna S.Rajaram, International Institute of Indian Studies, Ottawa, Canada),1994. 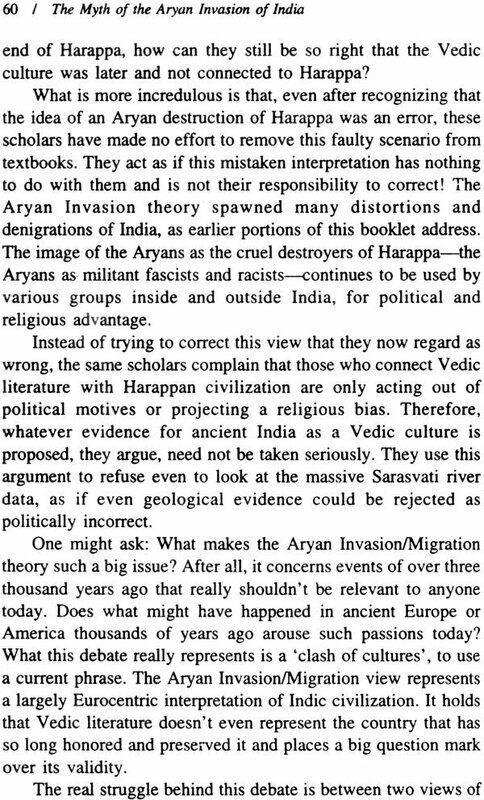 The Myth of the Aryan Invasion was first written in 1994 in order to summarize important new information on the ancient history of India that refutes commonly held views on the subject inherited from the nineteenth century. It was a condensation of longer material from books of mine like Gods, Sages and Kings, Vedic Aryans and the Origins of Civilization (with N.S. 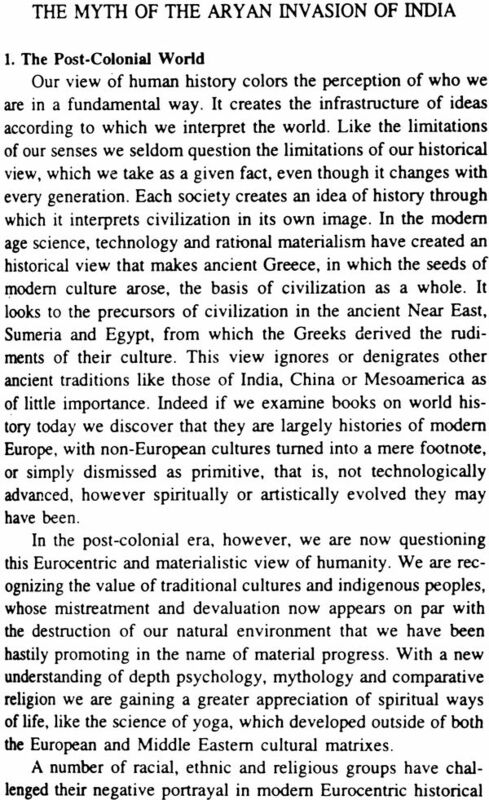 Rajaram) and In Search of the Cradle of Civilization (with Georg Feuerstein and Subhash Kak). 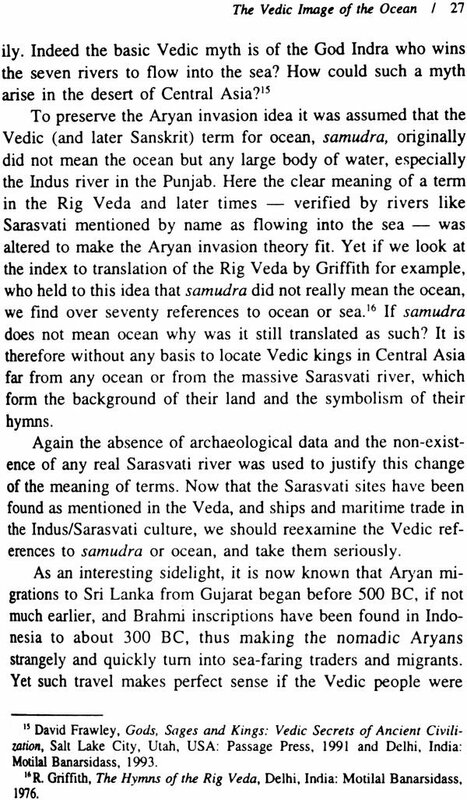 The 2001 update reflected my recent book Rigveda and the History of India that pushed the Vedic horizon further into the South India. The current 2005 edition reflects information from a new book that N .S. Rajaram and I are completing for the Swaminarayan movement and their New Delhi temple Akshardham, the largest to come up in the city in perhaps centuries, and its cultural displays. 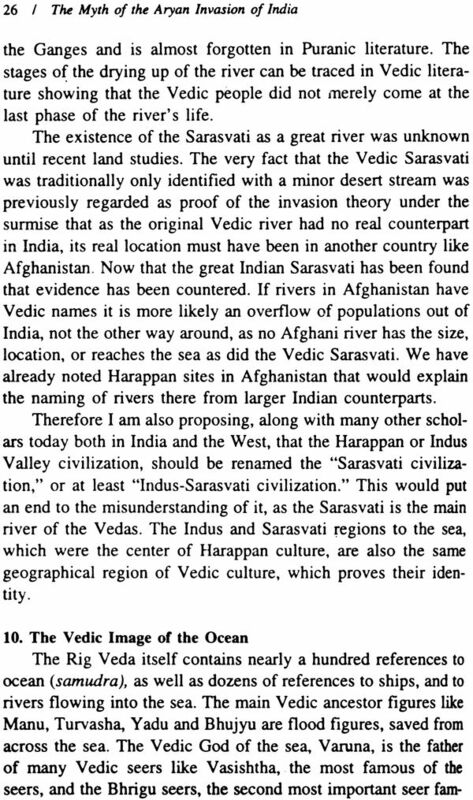 That book (Ancient India: From Oceanic Origins to the End of the Sarasvati) will take the origins of the Vedic age further back in time and in the direction of Southeast Asia. The amount of information available relative to ancient India is now much more extensive than that considered in old textbooks still used in India's schools and in most schools in the West. Numerous new archaeological finds, including several larger than Harappa, the geology of the Sarasvati River, the natural history of the region, Southeast Asia as the homeland for most human populations prior to the end of the last Ice Age, new views of genetics, new theories of linguistics, archaeo-astronomy, and a greater sensitivity to Vedic texts and their vast spiritual and cultural implications, are only part of the new fabric to be woven in order to really understand ancient India. Whether one may agree with the details, it is clear that the ancient history of India needs to be totally recast. The history and cultural heritage is largely an indigenous development of the same basic peoples that have inhabited the region for over ten thousand years, as they have adapted to their environment and also discovered its spiritual essence in its great mountains, rivers and oceans. It is time to look at the history and culture of India as a whole, organically, and in an integral manner according to its own internal impetus as the primary factor. Older views of India based on outside on based on outside migrations, external cultural influences and foreign borrowings as the primary forces are the products of a failure to understand the real soul and spirit of India. In the twenty first century in which the antiquity of cultures all over the world is being extended back centuries, if not thousands of years, there is no need to keep the history of India frozen around speculative events of 1500 BCE that have so far failed to prove themselves. It is time to open the door on India's great ancient heritage that takes us back to the very dawn of time. This primary message of the book remains the same.